Combining the therapeutic benefits of controlled compression and cold, the Aircast Cryo/Cuffs minimize hemarthrosis, swelling, and pain. The anatomically designed cuff provides complete coverage for treatment. I had surgery on the bottom of my foot. Is there a cuff that would provide coolness to the bottom of my foot? Thank you for contacting Better Braces. The Foot CryoCuff bladder is only on the top of the foot, but it can be posistioned upside down so the cold is on the bottom instead of the top. I see the different sizes for the Knee cuff. Where are those measurement shown done exactly on my leg? Thigh, knee? I am Having total knee replacement surgery. I want to make sure the cuff I order will fit over the bandages as well fit when the bandages are gone. The measurements are based on a knee center circumference, 6 inches above, for the thigh, and 6 inches below, for the calf. Just purchased the cryocuff for shoulder. Housekeeper threw chest strap out in the trash (now gone). How do I order just the chest strap (regular size)? CAN WE ORDER THIS FOR A PATIENT'S UPCOMING KNEE SURGERY AND WILL HIS INSURANCE PAY FOR IT? I have a Cryo/Cuff / C with a knee cuff, and I need the electric power plug. How can I get that, or will a generic plug work? If so, what do I look for? For a male foot size 8, what size foot cryocuff should I order? I frequently have tendonitis in both Achilles tendons. Is there a way to connect 2 boots to one machine or do I need 2 machines? How do I drain the cuff? To drain the cuff just unplug a power chord if you are using one, place the cooler on the ground and as long as the cuff is raised above the cooler the water in the cuff should drain back into the cooler. What is the difference in size between regular and XL on the shoulder cuff? The only difference will be the length of the strap. The Regular cuff will come with a strap that will fit a torso circumference between 34" and 42". The x-long strap will fit 42" to 54"
I fell asleep and accidentally had cuff on ankle for 1 hour straight. What , if any, damage should I look for? Entire foot has been throbbing since then. Any possible correlation? I have a motorized Cryo/cuff for the knee. I have lost the power pack. What is the output voltage of the power supply? I have a 12v power pack that works, (tried for a few seconds only) but I don't want to ruin the electronics with over voltage. I have pain in my peroneal tendon near the base of my 5th metatarsal and pain extending slightly up towards my ankle. (see picture linked below) Will the ankle cuff extend this far to do both? Or does the foot cuff extend upward enough to cover both? How do I measure for a shoulder cryo cuff. I have a rotator cuff repair coming up. Is the circumference just around the chest or with the arm at my side? Thank you. Can heat be used in the Cyro Cuff? I have had a aircast cryo/cuf for shoulder since 2 surgeries about 6 yr. ago. Since then I have let others In my area use it after their surgeries. A friend is having rotator surgery on Tuesday. Motor pumps but I cannot get water into the cuff. I have water at the disconnect but cannot get it to enter the cuff. It appears that tubing was not sanitized by last user. Looks like black bacteria in tubing. I've even tried air compressor to get something into cuff but no luck. ANY SUGGESTIONS? Which cuff is used for the calf? What is the maximum size waist that the back/hip/rib cuff will fit? I'm a big guy and the cuff for back/hip is not large enough for me. I wea. 3XL t-shirts. Can you tell me how I can get a larger cuff for my back and hips. What is the maximum diameter of the back/rib/hip cuff? Thanks. The dimentions of the Back/Hip/Rib Cuff are 10.3" x7.6"
Do you offer a right and left ankle cuff? I see no mention of that when I am looking to place an order. On another site they make mention of left / right? I want to ice foot for a chronic bad ankle and also for plantar fasciatis. Will the ankle cuff for both? Will the ankle cuff work for bunionectomy? Does the ice water go all the way down the foot area? I am debating between it and the foot cuff. Thank you for contacting product support. You would want to go with the foot cutt, the ankle does not come down all the way to the toe area. Which cuff do you recommend to cover the heel for treatment of Sever's Disease? Thank you for contacting product support. The ankle cuff will cover the heel. I already have the cooler from a previous surgery. However, the insulation disc has been misplaced. Is it possible to order a new disc. I also will have to order the universal shoulder cuff. The cuffs are available for purchase. Please see the link below. I am a 5'4" female with small ankles weighing 122lbs. Should I order the pediatric ankle cuff? I have a complete rupture of my Achilles' tendon. Pediatric Cuff is designed to treat ages 1-7yrs old. Shoe size is 1-4 for pediatric. I recommend the standard size unless you wear a size 4 and under. I have a "Back/Hip/Rib Cryo/Cuff ". I can't find any care instructions on the Aircast web-site. I have a Cryo/Cuff Cooler that the valve that the hose attaches to is broken off of the cooler. Is that part available? Also, are the cuffs the same for the for both the motorized and non-motorized models? The valve is not sold separate but the hose and the cuff's are. There is a 6 month warranty so if it's under warranty the manufacturer will replace it at no charge. Yes the cuffs for both units are the same. on what I can use to clean it. Thank you. You can use mild soap and water to clean the cuff and cooler. How do you empty the cuff? Keep the cuff connected to the cooler, raise the cuff over the cooler, loosen or remove the lid and bleed the pad like a tube of toothpaste. Should you have any additional questions, please call 888-405-3251. Thanks. There is a pin hole in the aircast boot. Is there anyway to patch? At this time there are no recommended methods of patching a leaking Cryo Cuff, a replacement would be required. 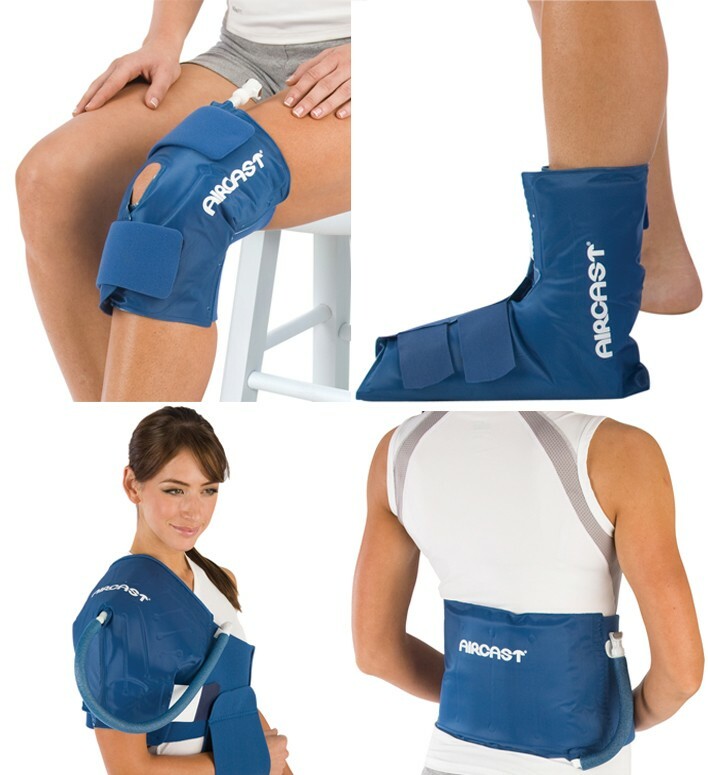 Will this cuff provide cold therapy coverage to the entire knee including the back portion of the knee? In other words will the cold therapy completely surround the entire knee? Yes, the entire cuff will fill with water and completely surround the knee for maximum cryotherapy. What is the best way to measure the knee for the correct size cryocuff? take the circumference of your thigh 6' above the center of your knee. I also own the knee Aircast cuff & used it post knee replacement, so I knew I would want to purchase the shoulder Aircast cuff for my rotator cuff repair post-op recovery. These products are invaluable to have after surgery where you will have pain/swelling. Instead of putting ice, I place (3) frozen water bottles in the canister, add water to the water line. Then a couple of times a day I replace the (3) frozen water bottles as needed. After my knee surgery, this has been the best thing ever invented for keeping pain and swelling under control. So thankful for my Cryo/Cuff! I've had surgery on both knees & the Aircast Cryo/Cuff with cooler works wonderfully. It stays in place, is easy to use and takes care of the swelling. I would highly recommend this product. Used the ankle CryoCuff after my Achilles surgery, very effective application of cold therapy, highly recommended. The shoulder cuff really helped me during my healing process immediately after my surgery. It is much more comfortable than ice packs and less messy. Pros: No mess, no dripping water leaking out of the package. Continuous source of cold water. I used the knee cuff with the IC Cooler. It was very comfortable and made applying ice very easy and comfortable. It stayed in place for maximum coverage. I have just ordered the back cuff to for ease in iceing my back after chiropractor.. I had purchased the motorized cryo-cuff cooler with the ankle cuff and bought the foot cuff separately to focus the cooling in the fore- foot and toes where my surgical sites were. Everything worked perfectly and beats icebags by a country mile. It's nearly impossible to wrap ice bags around the entire foot without draping it on the toes. The foot cuff resolves that issue. Totally worth the investment. My only mistake was initially too large of a foot cuff. I wear a womans size 9-9.5 and the medium size cuff is the most appropriate size and will accommodate a bulky post-op dressing. Pros: Excellent circumferential cooling. Motorized cryo-cuff cooler eliminates the need to constantly raise and lower the cooler to refresh the water. The knee cuff I purchased is a replacement for the one I originally had when I had my knee replaced. This is a wonderful product, very easy to use and effective. It took a while to figure out how to use it, but we eventually got it and it works well.